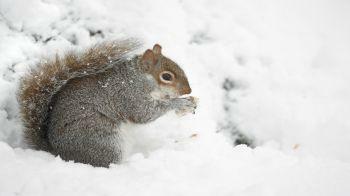 The coldest months of the year can be a challenging time for birds, hedgehogs, squirrels and other wildlife. Make your garden wildlife-friendly. Leave undisturbed ‘wild’ areas in your garden and provide piles of leaves or brushwood as nests for hedgehogs to rest and hibernate in. If you have a frozen pond, make sure you check it every day for ice, as toxic gases can build up in the water of a frozen pond and kill fish or frogs. If a pond freezes over, carefully place a saucepan of hot water on the surface to gently melt a hole in the ice. Never tip boiling water on to the pond as this may harm fish. Feed the birds in your garden. They may have difficulty finding normal food supplies so any alternative extra food you can put out will help. Try giving a range of seeds, fresh unsalted peanuts and table scraps and fruit. Garden birds love dried mealworms or waxworms, which can be bought from bird food suppliers. Keep a close eye on outdoor pets, such as guinea pigs and rabbits, and put extra bedding in their home and be prepared to move them into a shed or unused garage for extra shelter. If horses and ponies are kept outside during the winter they must have access to shelter at all times. Help squirrels survive the coldest times of the year by offering hazelnuts, walnuts and almonds, plus some chopped apple, beans, carrots or spinach. Don’t ignore your pets needs while celebrating. Try to keep a regular routine of feeding and exercising them, it will keep them happy and healthy. Give your pets a treat over the festive season but remember that too much rich food isn’t good for animals. Grapes, sultanas, raisins and chocolate are toxic to dogs.